The "Brazillian Light Minie Rifle" was so nicknamed by collectors after a rumor that these Belgian-made, Enfield-style short rifles were originally built for the Brazillian military, but were sold to US purchasing agents before they could be delivered to South America. While there has never been any documentation to back up this claim, the name stuck; and collectors have been referring to these attractive rifles as "Brazillian Light Minies" for decades. One thing that is very well documented is the fact that there were roughly 5,800 Light Minies purchased by the Federal Government in 1862. These American-owned rifles were denoted by the Federal Eagle plaque that was affixed to the wrist just behind the lock. The Brazillian Ligth Minies saw a lot of heavy service during the war. A Light Minie with a damaged muzzle can even be spotted in the background of Matthew Brady's famous photo, "Petersburg Dead"
The stock is in great shape with no cracks or rotten spots. 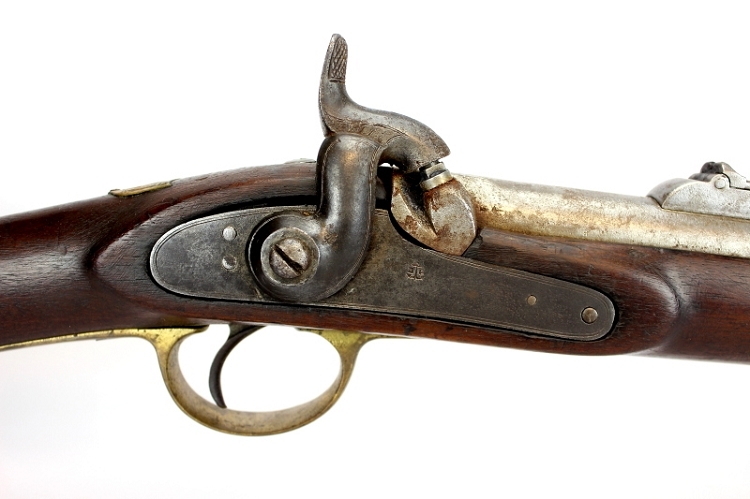 The wrist still proudly bears the Federal Eagle plaque; denoting this rifle as one of the 5,800 that was purchased for the Civil War.